Two ships carrying mixed oxide (MOX) fuel yesterday departed from the French port of Cherbourg en route to Japan. It is the sixth such shipment of MOX fuel from Europe to Japan. Two ships - the Pacific Heron and the Pacific Egret - are owned by Pacific Nuclear Transport Ltd (PNTL) - a subsidiary of International Nuclear Services. They are due to arrive in Japanese waters in the second half of September. 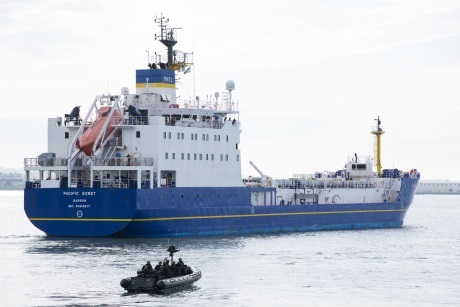 PNTL said, "The voyage is being undertaken with all necessary safety and security permissions from national and international regulators and the purpose-built ships are sailed by some of the most experienced nuclear mariners in the world." According to Areva, "MOX fuel falls within the category of nuclear materials requiring stringent physical protection measures. Extensive physical measures are incorporated into the transportation plan for the shipment of MOX fuel to Japan to ensure that the ships and their cargo are protected against the threat of theft or sabotage." The MOX fuel was ordered by Kansai Electric Power Company for use in unit 4 of its Takahama nuclear power plant. Areva announced last September it had started fabrication of 16 MOX fuel assemblies for use in that unit. MOX fuel contains plutonium recovered from used fuel by reprocessing. Used fuel from Japan, and other countries, has been routinely reprocessed in Europe, with MOX fuel and high-level waste being returned. Japan is working towards opening its own MOX fabrication facility, and has not sent used fuel to Europe for reprocessing since 1998. In February 1997, the Japanese government stated that, in line with the country's long-term commitment to nuclear energy, it was necessary for Japan to start using MOX fuel in its commercial nuclear reactors. Following this announcement, the Japanese electric power companies unveiled their plans to use MOX fuel in 16 to 18 reactors. Since then, several MOX fabrication contracts have started this process. Commissioning of the Rokkasho reprocessing plant in Japan, which is based on the Areva's La Hague technology, has been making slow progress. The facility is now scheduled for completion by September 2018. About 5% of the content of MOX fuel is plutonium recovered from nuclear fuel already used in power-generating reactors. Recycling the material in this way increases the energy it produces by 12%. If unfissioned uranium is also recovered and reused the figure increases to 22%. The process also allows the separation of the most highly radioactive fission products, meaning the volumes of the most dangerous wastes is reduced by over 60%.